Baby Kim and mom are finally at home. Here she is in the car seat. Speaking of car seats, I was thinking about the evolution of child car seat safety. Remember the pre-car seat days when people would put a baby in a laundry basket? Those were the dark days, weren't they? Did you grow up using a car seat? I didn't. The Active Pedestrian Detection System, part of the Advanced Pre-Collision System, is designed to help reduce the impact speed and damage in certain frontal collisions only. 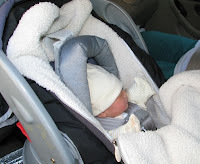 Many car seats are not installed properly. If you're not sure about your car seat, make sure to get it inspected as soon as possible. The other day, I saw a car seat that did not appear to be properly restrained and I politely explained to the parent that the car seat should be adjusted.